The Three Little Pigs were living in Pig Town. Their forefathers had taught them to never make their homes out of hay, sticks or even bricks if they wanted to survive the wolf. It wasn’t just the material they used to build their houses, but it was also important to find a safe location. As a result, they designed more durable and better located homes. Unfortunately for the little pigs, this did not stop the wolf from trying to eat them. All Three Little Pigs had different ideas of what the safest type of house would look like. Little Water Pig felt it was safest to move over to the lake because wolves hate water. Little Tree Pig felt it was safest to be above the ground in the treetops, where the wolf couldn’t reach. Little Mole Pig felt it was safest to move Pig Town below ground, where wolves and hurricanes wouldn’t threaten them. The pigs had never experienced a hurricane before, nor were they in a hurricane zone, but it was Little Mole Pig’s greatest fear that he would face one. So the Three Little Pigs changed the way pigs built houses in Pig Town because each felt strongly about his own idea of the safest spot to live. It was Little Water Pig’s first day on his houseboat. 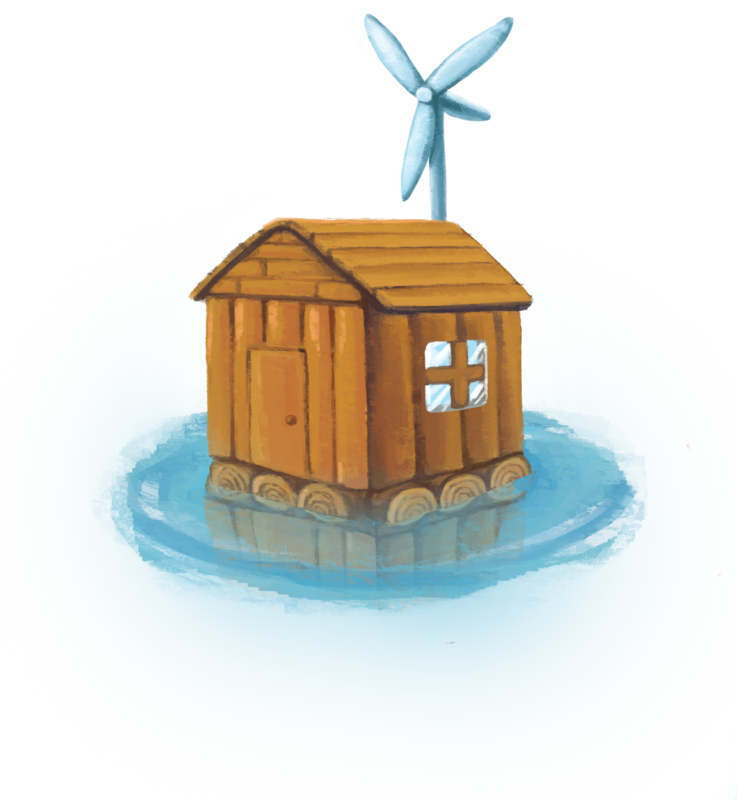 It was a simple, wooden house and it was fully powered by wind turbines. The turbines provided all the electricity and power needed for the engine. He loved his new house, although he found it rather small and quite limiting. He couldn’t clean the windows from the outside because there was no land to stand on. He also couldn’t hold a garden party for his upcoming birthday. But he could feel safe from the wolf. “Little Pig, little Pig, come to the land so I can come in”, said the wolf. So the wolf huffed and he puffed and he blew and he blew. The house didn’t fall over. It didn’t blow back either. In fact, the water between them didn’t even ripple. Although Little Water Pig was very smart and creative with building his new water house, the wolf was smarter. The wolf knew about the approaching drought, which was spreading throughout the land. He knew it was a matter of time before all the water dried up around the pig. The wolf patiently waited on the side of the bank. With each passing day the soil became dryer until there was no trace of fertile soil left. Sure enough, not long after that, Little Water Pig’s boathouse was on dry, cracked land. By then, the wolf was starving and he ran towards Little Water Pig for his next meal. Little Water Pig jumped out the window and sprinted as fast as his stumpy legs could take him all the way to Little Tree Pig’s home, who couldn’t have picked a tree further away from the lake. Little Tree Pig was standing below his tree house built between tall pine trees and one fir tree. Looking up at his house, he saw a leaf dropping, slowly swaying back and forth as is fell gently. It landed gracefully on the ground. He scrunched it up and threw it in his recycling bin. A second one started falling, but he caught it before it landed and threw it away. He felt triumphant for being able to catch and control the leaves as they dropped. Then it occurred to him, this is the perfectionism that Little Water Pig complained to him about. So he kicked the bin over and scattered the leaves. Resisting the urge to pick them up again, he climbed into his tree house where he had made a place for his best friends, the bees. From the top, Little Tree Pig had a bird’s eye view of all of the possible dangerous situations, although he was yet to see any danger. Until now. He saw the wolf chasing something. Could it be Little Water Pig? He threw down his rope ladder and waited for Little Water Pig, who came running as fast as he could around the corner. Little Water Pig grabbed hold of the ladder and scurried up. They reeled the ladder in before the wolf could climb up too. They were safe! Now the wolf was angry. He shook the tree from the base, “Don’t think you’re getting away from me.” The pigs held on to the branches tightly as the tree shook. The beehive above them fell off the branch and bounced all the way down the tree until it hit the ground. The wolf opened his basket, grabbed the hive with all the angry bees and closed them inside. The pigs were smart, but the wolf was smarter. He used a magnifying lens, the sunlight and the dry sticks that had fallen in the forest to create a thin wisp of smoke, then he huffed and he puffed. With one final blow, he blew a force of life into the smoke, which ignited the beginning of a raging and uncontrollable wildfire. The pigs screamed and scattered out of the tree and away from the woods. They ran on the tip of their hooves through thick fumes and away from the wolf to Little Mole Pig. From underground, Little Mole Pig heard the screaming of the pigs through the crackling of the fire and the whipping of the flames. He curiously opened his trapdoor, which lead out to the dangerous world, peered over the top of his snout and saw the two little pigs trying to outrun the fire and the wolf to Little Mole Pig’s door. Little Mole Pig saw a tall burning tree that seemed to be falling in slow motion. He yelled out to them, “Watch out!” The tree landed with a thump. It didn’t completely miss the pigs. It singed the hairs on their tails, but nothing more. The fallen tree also managed to separate them from the wolf. The Two Little Pigs went underground to Little Mole Pig, out of breath and out of danger. Little Mole Pig was smiling. His house had survived the drought and the fire. The troop carefully navigated their way through the parts of the woods that weren’t already ablaze. Behind the layer of fog, they saw two figures charging on the tip of their hooves. “There they are!” said Little Wise Pig. “The smoke is making it very difficult to see far ahead”, said Old Lad. They followed after The Two Little Pigs, their scooters crunching over the dry sticks and leaves. They then pulled their brakes sharply when they saw the wolf standing over the trapdoor. Seeing the big, bad wolf, Wise Pig was not feeling as courageous as was before. He began to doubt himself. Scarlet saw his angst and said, “We came to save the little pigs, so let’s save them!” He looked at her and nodded. They all nodded back, and in first gear, spun their scooters to come face-to-face with their problem. They closed in on the wolf. Cranky Pig 1 said, “Ha! You’re not going anywhere, Wolf.” With that, the wolf jumped over their heads and vanished into the smoky woods. The Three Little Pigs had never met their great-grandfathers, the Three Old Pigs, so it took some time before they understood what they were explaining. Only then did Little Mole Pig put away his repellent and instead offered them a slice of Black Forest cake. “We know what fear looks like. We know how it feels to live not knowing if you’ll see the next full moon. Everyone should feel safe and protected. Everyone should be free from fear. Everyone should have a safe house to live in. In our time, no one knew to help us. But today, the world knows more about its problems”, said Wise Pig. Again, Tusker tried to squeeze more than his neck through the door, but he couldn’t. Little Mole Pig said to him, “My friend, I did not build my home with elephants in mind”, and they all laughed. Bamboo Queen held up her mobile phone and charger and asked Little Mole Pig if she could borrow his phone charger. He gave it to her, but his charger was not compatible with her mobile phone. Nobody else had a suitable charger, so in her frustration she threw her dead phone into the waste bin, but it was the wrong bin, so Tree Pig scuttled over to put it in the bin for recycling electronic waste. While this was going on, Anansi the spider dropped down from the ceiling. Little Water Pig, who was tapping his fingers on the table, jumped up and snatched the insect repellent, pointing it at Anansi. “I hate spiders!” said Little Water Pig. Anansi smiled and sat on the shoulder of Cranky Pig. Little Water Pig put down the spray and started tapping his fork. Cranky Pig’s eye was twitching from the constant tapping, a sure sign that he was about to snap. “Stop it! Stop fidgeting!” There was an uncomfortable silence, but not for too long, because the wolf’s hairy hand burst through the surface of the earth and snatched the Three Old Pigs. Everyone was screaming, including Tusker whose head was now stuck. The Three Little Pigs left the seniors in the woods as they ran after the wolf without a plan. “Wise Pig would want us to continue”, said Scarlet. “You’re right, Scarlet. Lead the way…” said Tusker.